The North Carolina village of Frisco is known for its heavily wooded maritime forests on the soundside or western edge. Situated at the edge of what is known as Buxton Woods, between the villages of Buxton and Hatteras, tiny Frisco has a flavor all its own. Once known as Trent, until the Postal Service changed the village's name in 1898, Frisco has deep roots in American cultural and military history. On September 5, 1923, General Billy Mitchell of what was then the Army Air Service used a tiny airstrip at Frisco to launch a series of bombing run demonstrations against battleship targets off the Outer Banks. This exhibition left no question to the effectiveness and necessity of air power, and was a major impetus in establishing the United States&apos; modern Air Force. The Frisco Native American Museum is a must do when visiting Hatteras Island. The site of an ancient Indian village has been found near the museum and is being excavated. The tranquil museum is filled with authentic Indian artifacts and educational displays. 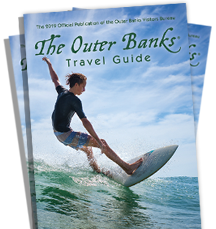 The proximity of Frisco to great surf fishing, charter boat docks and other things to do makes it an ideal vacation spot to enjoy with your family on the Outer Banks. There are numerous tucked away cottages that are nestled in the trees and dunes. There are also National Park Service camping accommodations popular because of their out of the way charm.